We have a new addition to our family, an adorable little kitten that we’ve named Shadow. Considering that both Ryan and I are allergic to cats, I never thought this would happen, but it did and it’s been great so far. The story of how little Shadow came into our lives is fairly similar to the story of how our old cat Figaro came into our lives, which is amusing because the two cats couldn’t look more different. In November 1992, Gail found a pure white cat roaming around outside her apartment on Hamilton mountain. It was starting to get cold outside and this little guy looked all alone. Gail took him in and when nobody claimed him after a while, she named him Figaro (after Geppetto’s cat in Pinocchio). Fig was with us until he died of liver cancer just before our tenth wedding anniversary in 2005. The boys barely remember him, but Gail and I miss him. He was such a people cat – he always wanted to be near us. It wasn’t long after he passed that we discovered that Ryan was allergic to both cats and dogs, and so the idea of getting a new cat was scuttled. I was also allergic, even to Fig, but it really only showed up if I was petting him or playing with him and then rubbed my eyes afterwards. Then they got itchy and I got stuffy, but once I washed my hands and face it was fine. There was no collar, and we looked around for anyone looking for him, but there was nobody. As we walked across the street to Trudy’s place, he followed and we didn’t discourage him. Trudy has two cats already so rather than bring him into the house, we brought him into the garage and gave him some food and water. Trudy put some litter into a cardboard box and he knew right away what to do with it. That fact, and the fact that he was in good physical shape told us that he did have a home, and recently. Considering our frigid winter, he was lucky he wasn’t outside during one of the –35°C days. That day and the previous couple were in the –5°C range. Trudy quickly made up some posters and posted them around her neighbourhood. 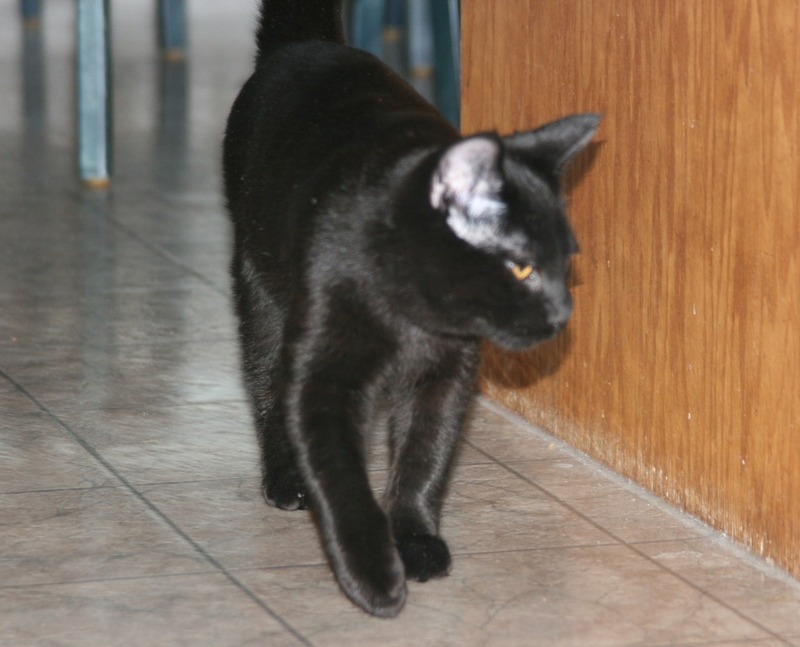 We looked online for local places where people might report lost pets, but no black cats were reported missing. This was also Family Day, so the Humane Society didn’t open until next morning. For the rest of the day, we took turns checking on him in the garage. Gail specifically told me to go rub my face against him and see what happened, just in case we couldn’t find the owner. I had no allergic reaction at all, nor did Ryan. Nicky was smitten and spent most of the afternoon sitting on a concrete step in a cold garage with the kitten. When I told him later that he was in the garage for at least two hours, he said “I was?” Honestly though, it was hard not to be smitten. Not only was he so tiny and adorable (I’m talking about the cat here, not Nicky), but he was just so loving. He was purring almost constantly, rubbing around your legs if you were standing, and jumping in your lap if you were sitting. Trudy already lives with two cats, two parents, and a two-year-old daughter, so their place was already full. I don’t know what the boys thought, but Gail and I quickly had a pretty good idea where this kitty was going to end up living if nobody claimed him. Trudy couldn’t bring herself to leave him in the cold garage overnight so she brought him inside and put him in a downstairs bathroom with some food, water, and litter. A little cramped but warmer than the garage, and no attacks from Trudy’s other cats. The next morning, she took him into the humane society and found he was not microchipped. Nobody had called her asking about him, and there were still no lost cat postings that matched this little guy. She did get a phone call a couple of days later, but the lady was quite far away and was looking for a cat that didn’t match this one. We found him on Monday. On Wednesday evening, Gail and Nicky drove back to Trudy’s place, picked him up, and brought him to our place. We figured that even if someone did claim him, at least he’d have a bigger place to hang out for a couple of days than Trudy’s bathroom. And if nobody claimed him, well, he was already home. That night, he hung out with me and Gail, sitting right by (and sometimes on) our heads, purring away, and occasionally head-butting us to try and get us to play with him. Eventually we had to put him outside the room and close the door so we could get some sleep. That only lasted a couple of days though, and then he figured out that he should leave us alone at night. He’s been really good since then. By Saturday we had bought him a litterbox, food dishes, and toys. At that point we decide to name him. He was our kitten now. If someone else had lost him, they’d done a crappy job of trying to find him, and the statute of limitations (that we had arbitrarily imposed) had expired. We each came up with a few names and wrote down all the ones we liked. From that list of about 10 names, we each chose our top three by secret ballot. One name appeared second on all four ballots – Shadow. Some names we did not choose: Ninja, Shade (also Nightshade), Phantom, and Sir Purrs-a-lot, which I added jokingly but Nicky actually voted for. We also decided against Snowy, which Trudy had suggested. 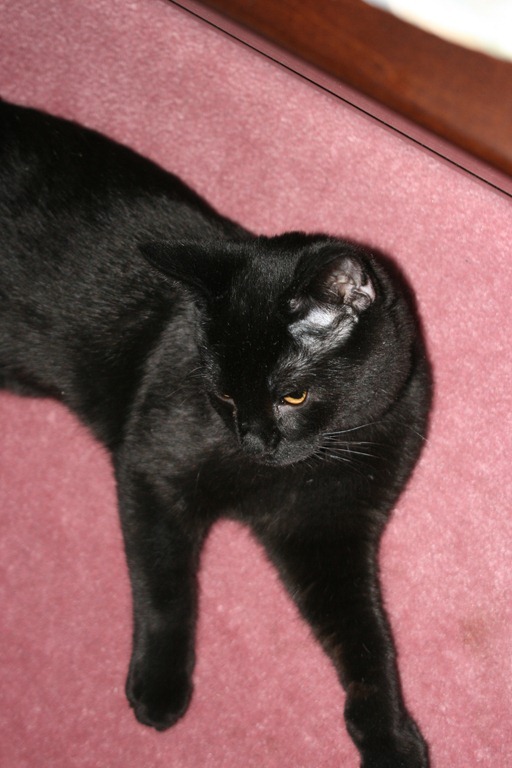 On Monday, Gail brought him to the vet for a check-up and unlike Figaro (who, when we got him, had fleas, worms, and various other things that were expensive to remove), Shadow Perrow was clean and healthy. Shadow has been part of our family for over a month now and already we can’t imagine life without him. He still purrs and meows all the time and rubs around our legs and jumps in our laps. He loves to play with the toys we bought him but also things like pencils, straws, and Q-tips he digs out of the bathroom garbage. He loves his treats and the wet food he gets in the morning, but isn’t so crazy about the dry food he gets in the evening. He also likes to sit on the toilet seat and dip his paws in the water, then leave little wet footprints around the bathroom, so we always keep the lids down now. Shadow’s made his way into the garage a couple of times, and seems to really love it there. Who wouldn’t love a cold dirty concrete floor with a half-inch of water in the middle (where all the snow from the cars melts)? So now whenever we come home we park in the garage, then close the garage door (so he can’t get outside), then open the door into the house and catch him before he dives past us. Even when putting stuff in the blue boxes or green bin, we have to close the laundry room door, which had previously stayed open for the past 15 years. We decided that if we were to go to the local pet shelter and a cat had behaved towards us the way this one did, we’d take him in a heartbeat. Just like Figaro, Shadow chose wisely when he found us. This entry was posted in Family, Figaro on April 3, 2014 by Graeme. We had to have Figgy put down this afternoon. He seemed to be getting better for a while, and then worse. His vet’s appointment yesterday morning showed that his liver enzyme numbers were elevated again — not as bad as the first appointment, but still 4-5 times higher than they should be. They gave him an ultrasound yesterday afternoon, where they found cancer in the lining of his liver. Perhaps he had fatty liver disease as previously thought and perhaps not, but either way, the cancer was there too, and so there was nothing that could be done. Obviously this was a very difficult decision to make, but at the same time, it was a very easy decision. At best, Fig’s uncomfortable and unhappy, and at worst, already suffering in pain. Either way, the suffering would get worse, and there is no chance of recovery, so ending the suffering was the only choice we had. Anything else would be prolonging his pain. The weird thing is that once we found out about the cancer, and brought him home for the night, he acted differently, almost back to normal. He even ate some dry food this morning, which he hasn’t eaten in 2 weeks. 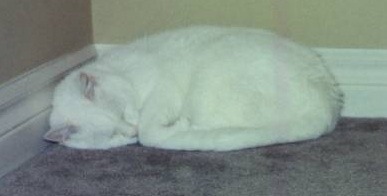 He slept beside Gail last night, and purred when we pet him, and didn’t try to hide under or behind things. It’s almost as if he understood what was happening and had accepted it. Sleep well, Figgy. You will be greatly missed. This entry was posted in Figaro on October 15, 2005 by Graeme. Heard from the vet today – Figgy’s going to be fine. He’s been eating pretty well, and his liver enzyme numbers are way down (one of them is supposed to be under 120 — his was up over 940 on Friday, and down to about 240 today), so the doctor said he’d be happier in his own home environment. Gail’s going to pick him up this afternoon. You can be damn sure that we’re going to pay closer attention to the amount of food he eats from now on! This entry was posted in Figaro on October 3, 2005 by Graeme. Had a bit of a scary day on Friday. I went to the dentist in the morning and when I came back, my cat Figaro was sitting on the kitchen chair, looking at me. I noticed that his ears and nose seemed a little yellow, instead of the usual pink. Upon closer inspection, I found that they were quite yellow, as were his nose, lips, and the whites of his eyes. Gail and I had noticed the day before that he hadn’t been himself for a day or two. I immediately called the vet and brought him in. She examined him and told me that he had liver disease. She said that most of the time, this is caused by cats simply not eating. After a while, their body starts to process their body fat, and sometimes the liver gets overwhelmed and shuts down. Then this causes nausea, which makes the cat even less likely to eat, so the whole thing spirals. He’s lost a pound (i.e. 10% of his body weight) since his last checkup a month ago (at which time he seemed in perfect health). She told me that they’d have to keep him there for the weekend. The type of liver disease that she thinks he has is very treatable – as long as he starts eating again, his liver will start to regenerate itself, and he’ll be fine. They started him on anti-nausea medication, and managed to get him to eat something, though he threw everything up Friday night. We went to see him Saturday morning, and he did seem a little less yellow, and a little less lethargic as well. We tried to go again Saturday afternoon, but they were just starting a procedure on a dog, so we couldn’t go through to where Figgy was, and they were about to close. The doctor called me a little while later, saying that he hadn’t thrown up all day, and was eating some more, and was even more bright than the morning, so this is good news. We heard nothing today (vet’s office was closed)- she’s going to call with an update tomorrow, and hopefully he can come home. Figgy’s been with Gail and I almost as long as we’ve been together — we started dating in February of 1992, and we found Fig (he was a stray) in November of ’92. I know that he’s not going to live forever, and I know that at 14, he’s already lived longer than most house cats. If anything were to happen, Nicholas is too young to understand, and likely won’t remember Fig for long, but Ryan seemed genuinely upset on Saturday, and said a number of times that he hopes Figgy gets better. Gail would be devastated, and I’m not sure I’d be much better. C’mon, Figster, you can beat this. On another topic, we all walked in the CIBC Run for the Cure this morning. It’s a 5k run/walk to raise money for breast cancer research. My mother and Gail’s mother are both breast cancer survivors, as was Gail’s late grandmother, so this is a cause that’s important to us. We raised $325 ourselves, and the event, held at over 40 different locations across Canada, raised over $21 million. Last year, the four of us plus my parents walked the 2k leg, but we decided to walk the full 5k this year. We knew the boys wouldn’t walk the full 5k, so we brought the wagon — good thing too, since they both stayed in the wagon the entire walk. Gail and I split pulling the wagon, so we each walked 5k, 2 1/2 of which was pulling a wagon holding 80 pounds of Perrow kids. This entry was posted in Charity, Figaro on October 2, 2005 by Graeme.